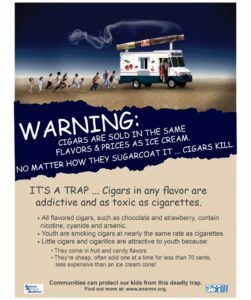 Because of their sweet flavors, low cost and attractive packaging, flavored tobacco products are especially appealing to youth, who are much more likely to use flavored tobacco products than adults. Young people perceive flavored tobacco products as tasting better and being safer than unflavored products, even though they are just as dangerous and addictive as cigarettes. Cigarettes containing flavors other than menthol can no longer be sold in the United States. 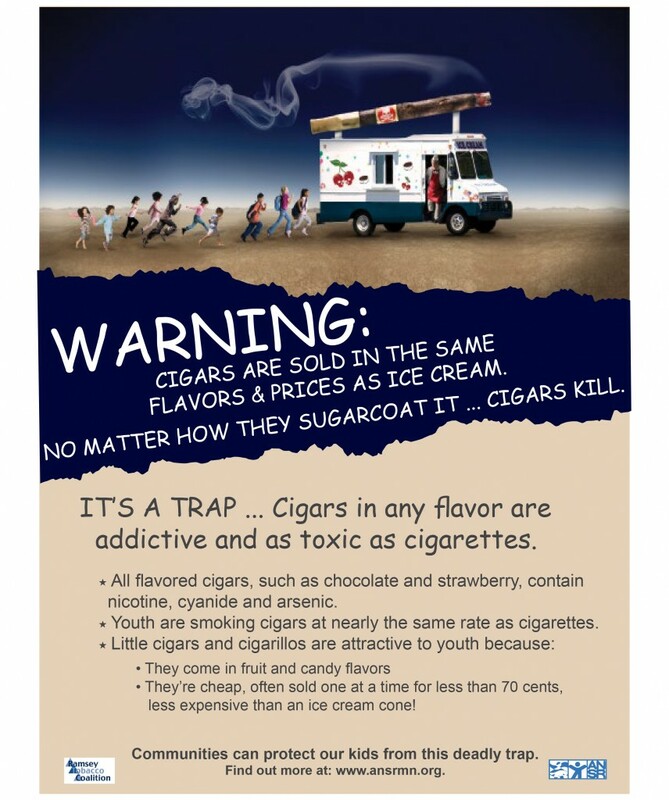 However, tobacco products such as cigars, chewing tobacco, blunt wraps, e-cigarettes and shisha, the tobacco used in hookah, are still sold in candy flavors such as bubble gum, strawberry, grape and frosting. 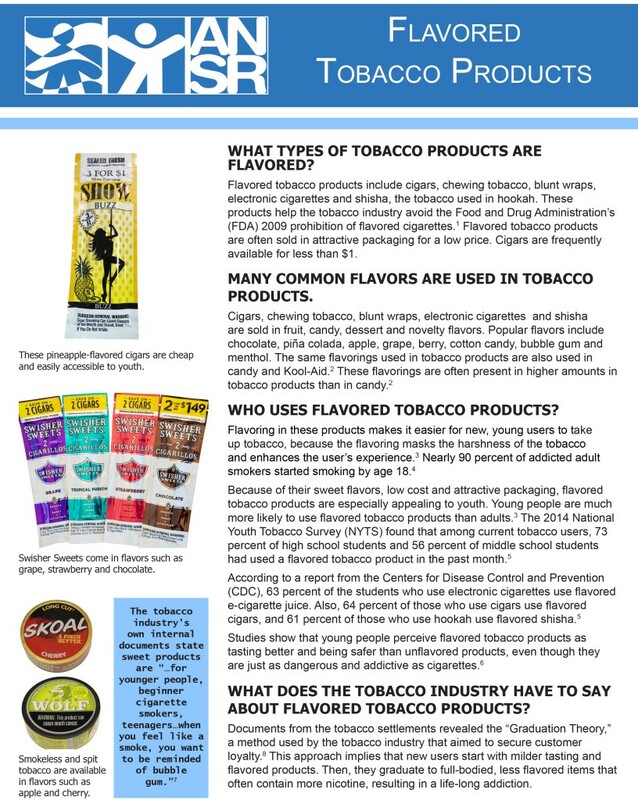 These products help the tobacco industry get around the FDA’s 2009 ban of flavored cigarettes. The Saint Paul City Council voted on Jan. 6, 2016, on an ordinance to move flavored tobacco products to adult-only stores and set a minimum price for cheap, flavored cigars that matches neighboring cities. Read about the unanimous vote here. Read a story about youth involvement in supporting this ordinance here. 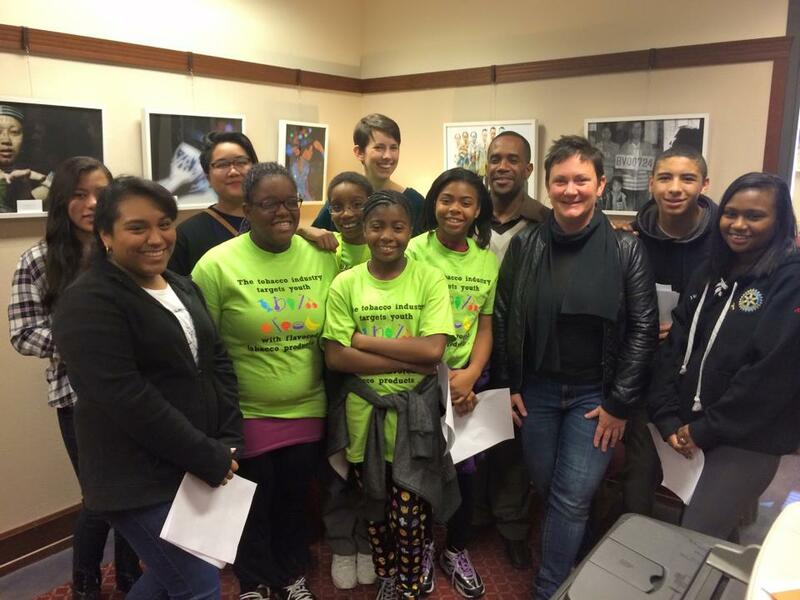 Youth advocates meet with Saint Paul Councilmember Amy Brendmoen. 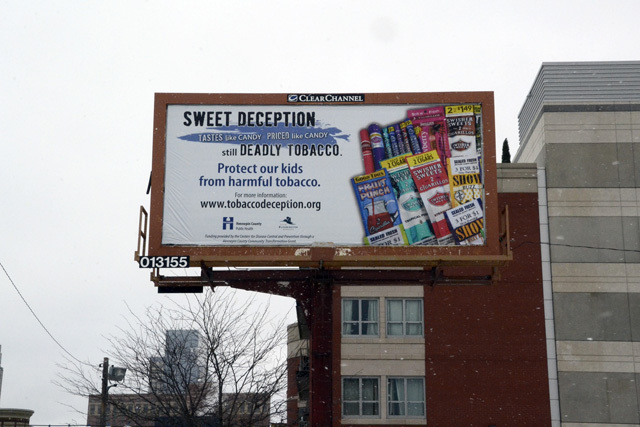 Targeting youth with flavored products is a critical step in the tobacco industry’s strategy to encourage addiction. Almost 90 percent of addicted adult smokers started smoking as teenagers. 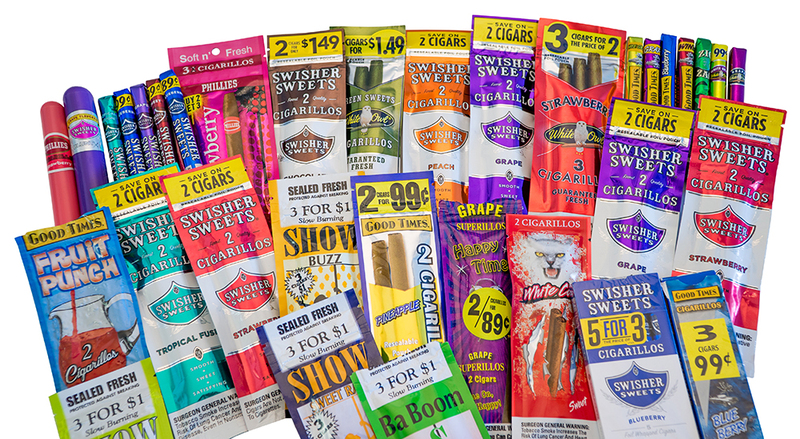 Candy and fruit flavored tobacco products mask the harsh taste of tobacco, and are shown to be attractive to youth. Many of these products are hard to distinguish from candy, gum and breath mints. 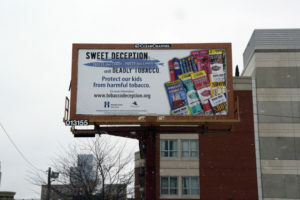 Flavored products may not taste like tobacco, but they are just as addictive and dangerous as other tobacco products. Research shows that youth believe flavored tobacco products are less dangerous and less addictive than non-flavored tobacco. Tobacco products contain nicotine, a highly-addictive substance shown to be detrimental to adolescent brain development. Cigar smoke contains the same toxins as cigarette smoke. Smokeless tobacco causes oral, esophageal and pancreatic cancers. An increasing number of young people are using flavored tobacco products, including menthol. 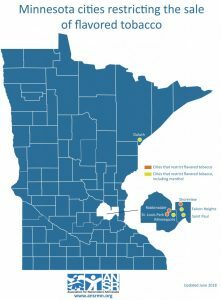 From 2000 to 2014, menthol cigarette use by Minnesota high school students increased from 20 to 44 percent. By comparison, only 25 percent of Minnesota adult smokers use menthol. A recent Minnesota Department of Health (MDH) survey found that nearly 13 percent of Minnesota kids are using e-cigarettes, which come in kid-friendly flavors like gummy bear and cotton candy. According to the Centers for Disease Control and Prevention (CDC), 42 percent of students who smoke use flavored products. Once kids start using one tobacco product, they are more likely to experiment with others. The Minneapolis City Council voted on July 10, 2015, in favor of an ordinance to set a minimum price for cheap, flavored cigars and to move flavored tobacco products to adult-only stores. Read the story about the unanimous vote here.